Needles at the Alaska AIDS Assistance Association syringe exchange in Anchorage. 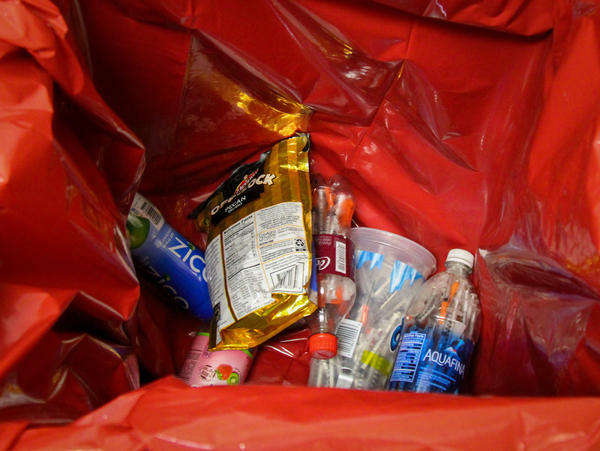 Alaska volunteers collect used syringes stored in puncture-proof plastic drink containers. 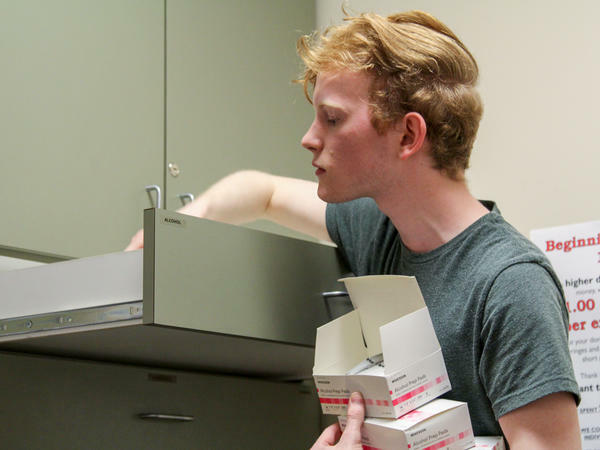 Volunteer Zane Davis restocks alcohol swabs and other supplies at the Alaska AIDS Assistance Association's Anchorage office. This is driving up healthcare costs at a time when low oil prices have left the state in a years-long financial crisis. And public health officials think this is just the beginning of the epidemic and its fallout. One program is working to prevent the transmission and spread of the disease. On a recent afternoon in Anchorage, dozens of orange-topped plastic needles clattered into a brimming red trashcan. Inside a supply closet, 22-year-old volunteer named Zane Davis runs through routine questions with a young woman who, like all the others who come to the clinic, isn't required to give her name to get fresh supplies. "How many needles did you have?" Davis asks. "Awesome," he says cheerfully. "Just so you know, we can only give you 50." The Alaska AIDS Assistance Association, known as Four A's, runs one of just four syringe exchanges in the state, and by far the biggest. The 50-needle cap is a new policy the organization implemented to keep up with surging demand. The busiest time of the week is Friday afternoons, explains Davis. "People are prepping for the weekend." In just a few hours, dozens of people come through, throwing out hundreds and hundreds of needles. Just before 5 p.m. when Four A's closes, a receptionist started taking information and sending people to Davis with post-it notes to get through the line that had formed. A cardboard box in the corner is filling up with Gatorade and soda bottles packed tight with syringes. The plastic drink containers are puncture proof, so they're a safe way to carry needles around. 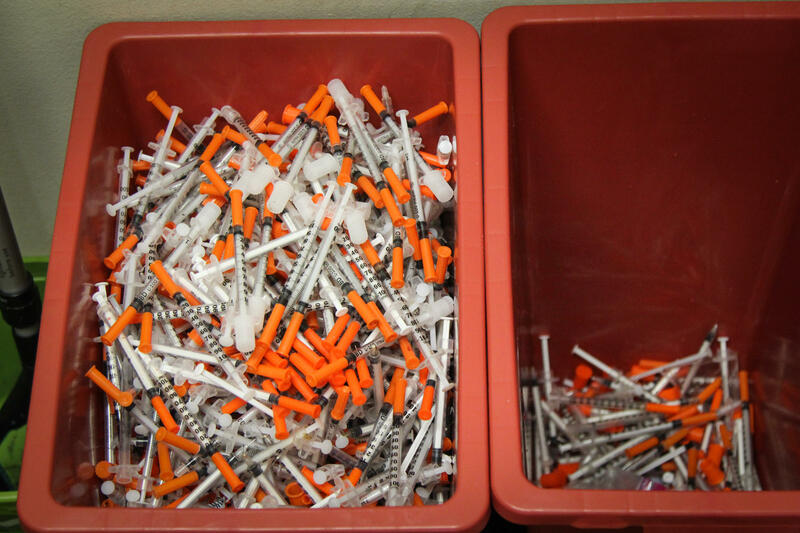 Last year, Four A's gave out nearly 500,000 syringes, which was double the number dispensed just two years earlier. This year they'll outpace that. This is the only place to trade in needles for hundreds of miles in every direction. Even in small towns where there is a pharmacy, there's no guarantee the staff will sell syringes over the counter. "They'll be like, 'Where's your prescription? Ya junkie,'" says Kerby Kraus. He has been clean for four-and-a-half years, and now helps run a recovery program. His path to shooting heroin started like a lot of others, first with strong painkillers that he found around the house. "It was just being in high school and popping some pills, and then you're snorting some pills, and then you're smoking some pills, and then all of the sudden you're IV-using pills," Kraus says. Kraus is from Wasilla, which is about 40 miles north of Anchorage. Back when he was using heroin, Kraus would stop at Four A's for clean syringes if he happened to be nearby. But if he was broke or sick from withdrawal, that was an insurmountable distance, and he'd shoot with used needles. That's how he got hepatitis C.
"I know who I got Hep C from," he says. "But I worried more about not being sick. It was 'I feel like absolute crap, and I don't want to feel this way no more.' "
In Alaska, the virus is exploding among people ages 18 to 29. It's a trend that is mirrored nationwide. A recent study in Alaska found that the hepatitis C rate among young people doubled between 2011 and 2015. Rural parts of the state are being especially hard hit. In the remote islands of Southeast Alaska, where the capital Juneau is located, the rate nearly quintupled, rising by 490 percent. "We talk mostly about opioid overdose deaths, but there's a lot more that happens related to opioid use than just deaths," explains Jay Butler, chief medical officer for Alaska's health department. Butler says worries about hepatitis C keep him awake at night, partly because of the wave of costs he sees approaching for Alaska and the country. Treating hepatitis C is extremely expensive. Until recently, the treatment available was ineffective and fairly toxic. But in 2013, the FDA approved a new class of antiviral drugs which can clear the body of hepatitis C 90 percent of the time. It is effectively a new cure to a dangerous and widespread chronic condition. "The price is the downside and why I usually don't say it's a miracle drug," Butler says. Because miracles don't come with a price, they're gifts." A treatment course of Viekira Pak or Harvoni, two common medications, can cost between $85,000 and $94,500. At that price, Butler estimates it would cost more than 10 percent of what we currently pay for all medical care annually in this country to treat the roughly 3.5 million Americans estimated to be infected with hepatitis C.
Though those prices have come down slightly in the last few years, the cost of hepatitis C treatments still put real stress on the health care program for the poor. "We've seen definitely an increase in the number of individuals who access these medications," says Erin Narus, the lead pharmacist for Alaska's Medicaid program. As patients and doctors have grown more familiar with the new anti-viral meds, they're being prescribed with greater frequency. In 2015, Alaska's Medicaid program spent $5.9 million dollars on hepatitis C treatments, according to Narus. The next year, that more than doubled to $13.6 million. And that money only bought treatment for around 150 people. Public health advocates say syringe exchanges are extremely cost effective in the long-term — especially when it comes to preventing people from getting hepatitis C in the first place or spreading it to others. State officials like Butler are pushing for more access to needles, especially in rural areas. For the cost of curing one person with the new antiviral meds, Four A's could run nearly a full year of its syringe exchange program. Copyright 2017 Alaska Public Media. To see more, visit Alaska Public Media. Alaska is one of many states with staggering rates of opioid abuse. Three-quarters of Alaska's overdose deaths last year are attributed to prescription painkillers or heroin. Transmission of blood-borne viruses like hepatitis C is also increasing dramatically, and with it health care costs. Alaska Public Media's Zachariah Hughes reports. ZACHARIAH HUGHES, BYLINE: Inside a cramped supply closet, a volunteer runs through questions as a 26-year-old woman empties dozens of used needles into a red trash can. ZANE DAVIS: So how many needles did you have? UNIDENTIFIED WOMAN: I have, like, 80. HUGHES: The Alaska AIDS Assistance Association, known as Four A's, runs what is by far the state's largest syringe exchange. It's all anonymous. No one gives his or her name when they come in to trade old supplies for new ones. DAVIS: Any cottons, tourniquets, cookers? UNIDENTIFIED WOMAN: Everything but cookers, please. People are prepping for the weekend. HUGHES: Zane Davis is a college pre-med student who volunteers here every Friday afternoon, the busiest time of the week. DAVIS: You know, there are a lot of people who just wait until Friday and then they use over the weekend. So they've really got to come in and stock up. HUGHES: In just a few hours, dozens of people come through, throwing out hundreds and hundreds of needles. Last year, Four A's gave out just under half a million needles, and this year they'll outpace that. This is the only place to trade in needles for hundreds of miles in every direction. Even in small towns where there might be a pharmacy that's no guarantee they'll sell clean syringes over the counter. KERBY KRAUS: They'll be like, where's your prescription, you junkie? HUGHES: Kerby Kraus has been clean for four and a half years and now helps run a recovery program. His path to shooting heroin started like a lot of people's across the country - first with pain pills. KRAUS: It was just being in high school and popping some pills. And then you're snorting some pills. And then you're smoking some pills. And all of a sudden you're IV-using pills. HUGHES: The town where Kraus is from, Wasilla, it's about 40 miles north of Anchorage. Back when he was using, Kraus would stop at Four A's for clean needles if he happened to be nearby. But if he was broke or sick from withdrawal, that was an insurmountable distance and he'd shoot with used needles, which is how he got hepatitis C.
KRAUS: I know where I - who I got hep C from. But I worried more about not being sick. It was, I feel like absolute crap and I don't want to feel this way no more. HUGHES: Kraus is part of the demographic in Alaska seeing the biggest uptick in hep C. The virus is exploding among people ages 18 to 29. That trend is mirrored nationally. A recent study in Alaska found that the hep C rate among young people doubled. Rural parts of the state are being especially hard-hit. JAY BUTLER: We talk mostly about opioid overdose deaths, but there's a lot more that happens related to opioid use than just deaths. HUGHES: Jay Butler is the chief medical officer for Alaska's health department, and fears about hep C keep him awake at night. If a person gets clean, treating their hep C is extremely expensive. A few years ago, Butler did a back-of-the-envelope calculation for what it would cost to treat the 3 and a half million infected Americans. It was 10 percent of the country's total health care spending. BUTLER: The price is the downside and why I usually don't say it's a miracle drug, 'cause miracles don't come with a price. They're gifts. HUGHES: Advocates say syringe exchanges are extremely cost effective in the long term, especially when it comes to hepatitis C. State officials like Butler are pushing for more access to needles, especially in rural areas. The price for curing the virus with medications is around $90,000. That covers almost a full year of running the Anchorage syringe exchange. For NPR News, I'm Zachariah Hughes in Anchorage. (SOUNDBITE OF THOM SONNY GREEN'S "VIENNA") Transcript provided by NPR, Copyright NPR.